You may use the Huawei E5180 LTE Cube at home for wireless internet connection. It’s a good wireless router in cool shape like a cube. With the development of LTE networks, the end-users and the network providers have higher demand for the user equipments. 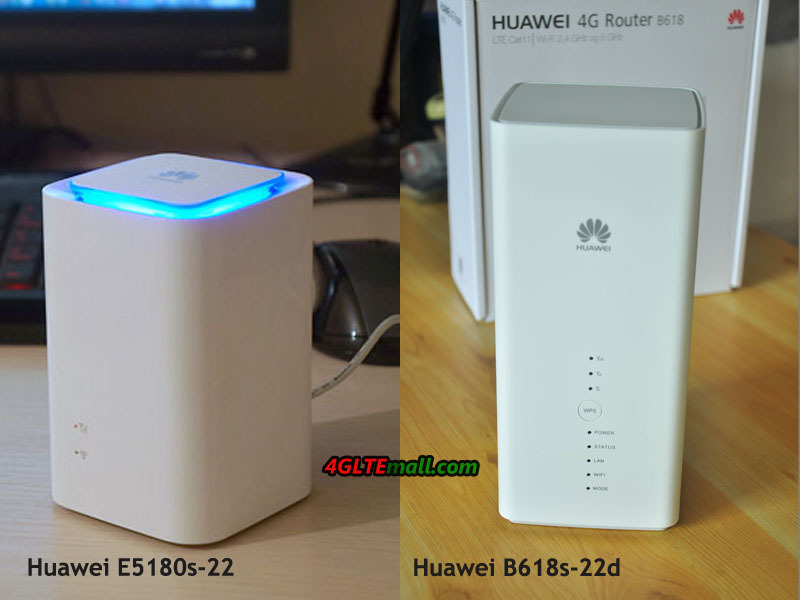 Here comes the new LTE router Huawei B618, which seems to be upgraded from the Huawei E5180 cube and in this article, we will see what’s the difference between the Huawei B618 and E5180, and what functions have been improved from the old one to the new one. 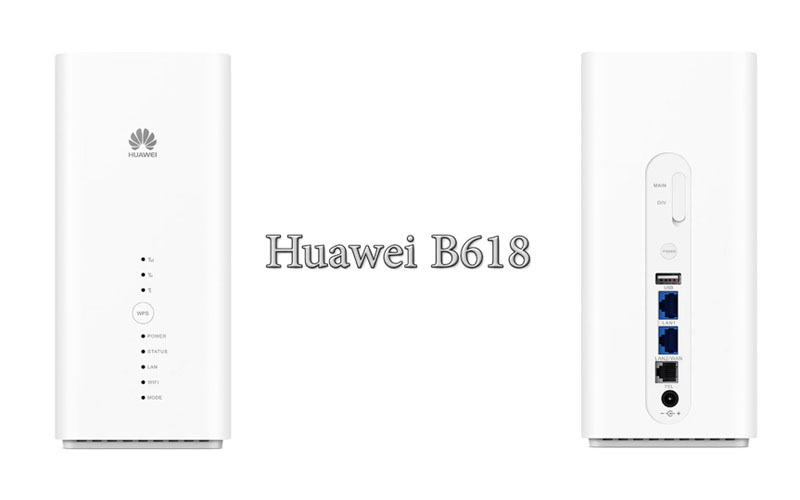 Following the Cube shape design of Huawei E5180, Huawei B618 is also in white color, but has larger body and higher if stands on a desk. Perhaps because the B618 has more interfaces for multi-functions, the B618 weights much more than E5180. On the front of Huawei E5180, there is only one signal indicator and one WiFi indicator, but on the B618, there are three signal indicators, and the power, status, LAN, WiFi, mode indicators & WPS button are listed. On the back, Huawei E5180s-22 has one LAN port, one telephone port and one power plug port. The E5180s-610 only has one LAN ports, no telephone port. Two connectors for external antenna are list at other side of the body. Huawei B618 has two LAN ports(one is also for WAN), one USB 2.0 port, one telephone port and power plug port. What’s more, B618 router also has the power button and two connectors for external antenna, which are covered by a small cap. On the top side, Huawei E5180 has the Huawei logo but it’s empty on the Huawei B618 top side. 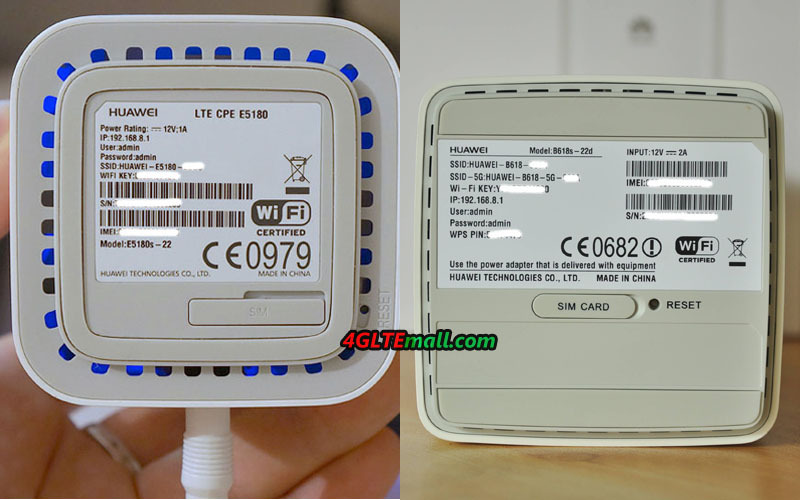 They both have one label on the bottom, which indicates the model number, SSID, WiFi key/password, power rating, IMEI and S/N number, and other certification logo. The Huawei B618 has extra WPS Pin on the label. And they both has the SIM card slot at the bottom and uses a Micro SIM card. As a LTE Category 4 router, huawei E5180 can support peak download speed up to 150Mbps and upload speed to 50mbps. The new Huawei B618 LTE Cat11 router could achieve almost 4 times of the speed from E5180, i.e download speed to 600mbps. 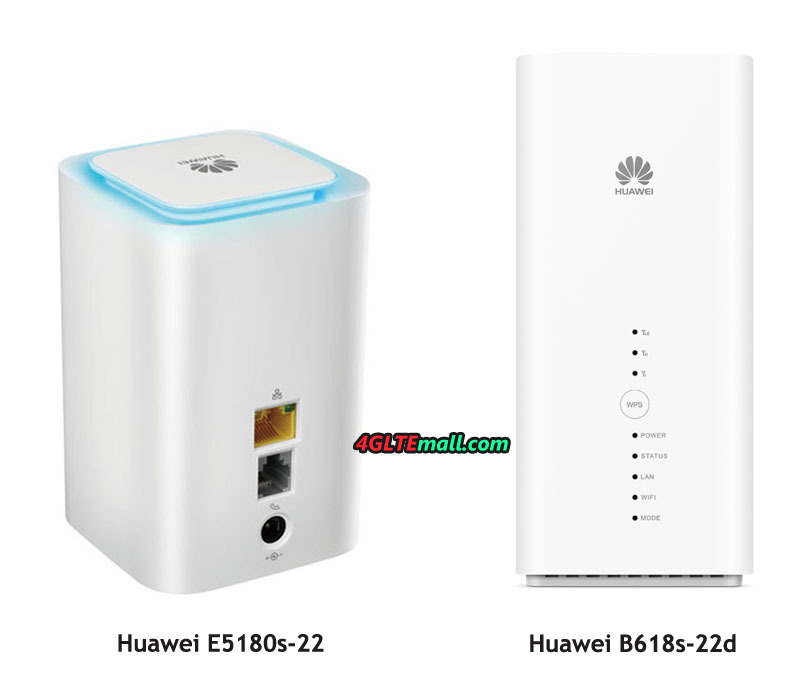 Huawei E5180 can support maximum 32 users to access internet while Huawei B618 can support 64 WiFi users, which is double of that from E5180. The WLAN standard of Huawei E5180 is iEEE 802.11 b/g/n on single band 2.4GHz. The Huawei B618s-22d can support the latest 802.11 ac besides a/b/g/n on dual-band (2.4GHz and 5GHz). 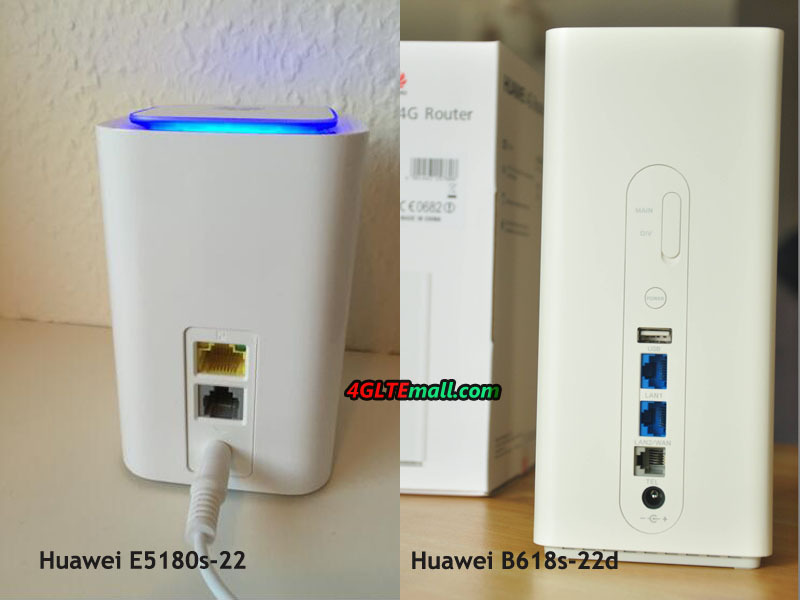 The two routers could both be managed from the web interface in the browser, but Huawei also provide the APP to manage the routers from Smartphones or Pads. It’s no doubt that the Huawei B618 with higher specs is much better than E5180, but frankly speaking, the Huawei E5180 cube is enough for most users at home or office. If you don’t have too much requirements for the router, Huawei E5180 is budget one to recommend. Huawei B618 is also good to recommend because it’s future-proof and would provide fantastic surfing experience under LTE-advanced networks.